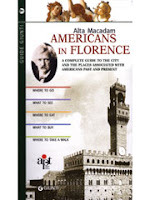 The guide book Americans in Florence is published by the Florence Tourist Board. The twist in this book (written in English) is that it is part tour guide and part history of the American fascination and influence in Florence. The guide part focuses on 8 different walks (some fairly long) around the city and surrounding hills while along the way calling out points of interest where Florence history intersects with an American visitor/expat of days gone by. Short back stories of various Americans are given. I thought the book was useful because after being here several months it opened up a different layer of exploration. It reveals points of interest that go beyond the typical “sites” – and the focus is on getting out and walking – which we love to do. Florence is a very walkable city and really is best enjoyed that way. ‘Sight-seeing’ from its original purpose of information, has been perverted by these travelling pests into a frigid duty. Nothing must be allowed to escape their observation that has attained the dignity of being a ‘sight’. They neither study, examine, nor look. ‘They have been there’…‘To see’ is the entire creed – to know, remember, or understand, are indifferent points. This quote is attributed to James Jackson Jarves and it is still very relevant 150 years later.